Chea Mony tells Brad about the day his brother was assassinated. After Chea Vichea was killed, his brother Mony stepped forward and was elected to lead the the Free Trade Union of Cambodian garment workers. Since 2004 he has served as the union's president. In addition to his work with the union, he has been unstinting in his resolve to clear the names of Born Samnang and Sok Sam Oeun, who were convicted of the assassination and served nearly five years until their release on December 31 pending a new trial. 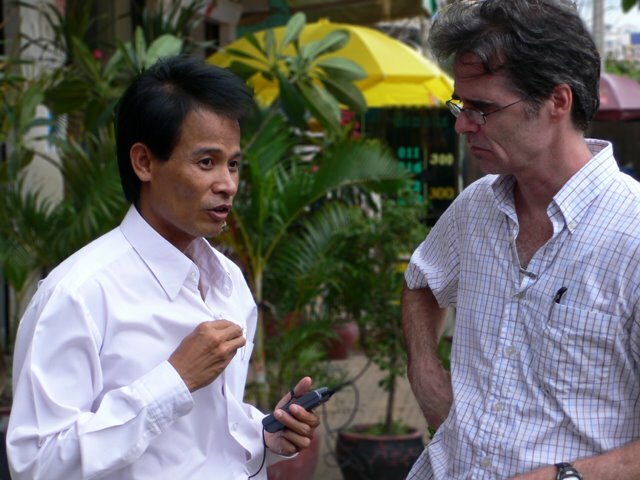 Now Mony, who features prominently in Who Killed Chea Vichea?, has been nominated for the 2009 Martin Ennals Award for Human Rights Defenders. Martin Ennals was the first secretary general of Amnesty International; the award is sponsored by Amnesty and nine other leading human rights groups. “I live in fear every day and am conscious of the risks I'm taking, but there are over 250,000 workers in Cambodia’s garment sector and they need to be defended by independent trade unions."